As a textile artist, utilizing my sense of color and design, I gain inspiration from nature. I studied my art in Missouri and Japan, and in Utah, my home. My knowledge and my love of textiles began when I started weaving in 1974 in Columbia, Missouri on a small oak table loom built for me with instructions from a book borrowed from the library. After a few years of weaving colorful tapestries of Midwest sunrises, I returned, with loom in tow, to Utah, to be inspired by red rocks and desert landscapes. I began study in the University of Utah Textile Program as the focus of my weaving shifted from craft to art. In 1986, I had the extraordinary opportunity to study in Kyoto, Japan, at the Kawashima Textile School. I learned a great deal during my stay in Japan, not necessarily limited to weaving and to dyeing, but most certainly influential to it. I continue to explore, and to pursue, my love of hand weaving and hand dyeing silk. My hand woven shawls and scarves, I now weave on my 45” Norwood floor loom, using select, natural fibers of wool and silk. In a fusion of abstract painting and textile practice, I hand paint 100% silk fabric. Dipping my paintbrush in the fiber reactive dyes, I apply the dye using the silk as my canvas. My hand painted silk sarongs, scarves and kimonos and my hand woven shawls and scarves are one-of-a-kind, unique works of art for the body. As well as being a practicing artist, I have been involved in the fashion industry for many years, from the glamour of runway modeling to immersion in the fashion trenches as a stylist and fashion director. 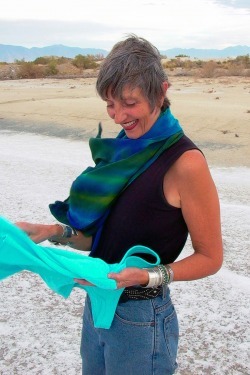 I wed the two worlds into my own textile-based business, “S-ENCE”. Additionally, I teach courses in fashion at the Salt Lake Community College Fashion Institute.